Metallica is back with another impassioned adult beverage partnership. Last year, we talked about the release of Metallica Blackened American Whiskey – a collaboration between the iconic heavy metal band and the Vermont distillery WhistlePig. Literally using Metallica music to drive the creation of this unique whisky, WhistlePig played “Blackened” among other classic songs to vibrate wood distilling casks to work the whisky deeper into the pores of their wooden surface. Well, looks like Metallica is having fun. Now the band is back with another impassioned adult beverage partnership. 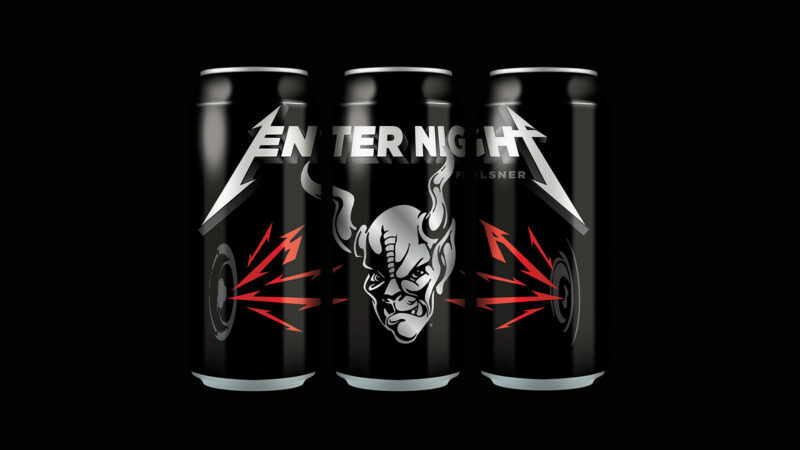 Pairing up with California’s Stone Brewing, the band has played an active role in the development and brewing of the new Enter Night Pilsner. Borrowing its name from Metallica’s most famous chorus, this beer remains true to the band’s defiant spirit. Described by Stone Brewing as “crisp” and “refreshing,” this 5.7%, 45 IBU beer is set for a nationwide release early this year and will be a featured beverage at every venue during Metallica’s upcoming Worldwired Tour.